From authentic Japanese dishes to decadent French cuisine, the best restaurants in Chicago offer some of the finest food in the nation. The Windy City's best restaurants feature food that will tempt almost any palate. 2610 N. Cannon Dr., 60614 (773) 477-5845. Dinner hours are Wednesday through Sunday, 5:30 p.m. until close. Brunch is on Sunday from 10:30 a.m. to 1:30 p.m. Reservations can be made on the company website. Dress code is casual. 980 North Michigan Ave., 2nd Floor, 60611 (312) 280-2750. Open Sunday through Thursday at 6:00 p.m. and Friday and Saturday at 5:30 p.m. Reservations can be made on the website. Jackets are required for men. 1723 N. Halsted St., 60614 (312) 867-0110. Alinea is open for dinner only, Wednesday through Sunday. Reservations are required, and the restaurant books up quickly, months in advance. Dress code is business casual. The decor is equally lovely, punctuated by dark mahogany furniture and neutral color tones. 676 N. St. Claire St., 60611 (312) 202-0001. Open Monday through Thursday for dinner 6:00 p.m. to 10:00 p.m., Friday 6:00 p.m. to 11:00 p.m., and Saturday 5:00 p.m. to 11:00 p.m. Reservations are encouraged. Dress code is smart casual. The expansive dining room is able to house many. Artfully designed, the interior features artwork from the likes of Andy Warhol and Gerhard Richter. 1050 North State St., 6060 (312) 266-4820. Dining room hours are Monday through Saturday from 5:30 p.m. - 11:00 p.m. and Sunday 5:00 p.m. - 10:00 p.m. Reservations are recommended and can be made on the website. Business dress is required. You can also opt for a mixed grill plate, and accompany your main dish with a la carte side dishes. Style Chicago gives the restaurant solid reviews for food, atmosphere, and service. 702 W. Fulton Market St., 60661 (312) 850-5005. Please call for days and times of operation. Dress code is casual and reservations can be made online. The food compliments the décor perfectly, as Carnivale is filled with bright, bold colors, open spaces and an overall lively setting. 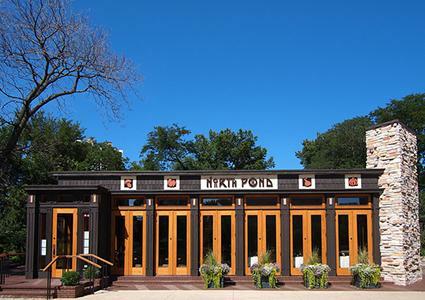 Epicurious.com lists this establishment as one of the best hot spots in Chicago. 868 N. Franklin, 60610 (312) 482-9179. Open daily for dinner at 5:30 p.m. Reservations can be made on the restaurant's website. The décor is filled with intricate tiling and a plethora of graceful arches. All this while a grand piano plays gently in the background. Reservations are recommended, as is business attire. 600 W. Chicago Ave., 60610 (312) 822-9600. Open for lunch Monday through Friday 11:30 a.m. to 2:30 p.m. Dinner hours are as follows: Monday - Thursday 5:00 p.m. - 11: p.m., Friday - Saturday 5:00 p.m. - 11:30 p.m. and Sunday 5:00 p.m. - 10:00 p.m. Reservations are available on the company website. Dress code is business casual. 440 S. LaSalle St. 40th Floor, 60605 (312) 663-8920. Open Tuesday through Thursday for dinner from 5:30 p.m. - 9:00 p.m, Friday for dinner from 5:30 p.m. - 9:30 p.m., and Saturday for dinner from 5:00 p.m. until 10:00 p.m. Reservations are encouraged and can be made on the website. Dress code is business casual. The décor at Everest is elegant with modern tables and chairs, luxurious hardware and fixtures, and lovely views. They are available for private events every day of the week, and there is also an art gallery on site. 615 W. Randolph St., 60661 (312) 377-2002. Hours are Sunday through Thursday 3:00 p.m. to midnight, Friday and Saturday 3:30 p.m. to 1:00 a.m. Reservations can be made on the website.